Way back in the pre t'interweb days all the cool kids read Smash Hits. Well all the cool kids in my incredibly rural and backward primary school containing only 38 pupils did. 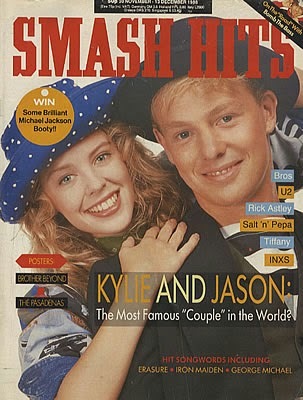 Smash Hits contained posters to adorn my room with Bros, Jason Donovan and Madonna, song lyrics so that I could torture my family even when I was listening to my walkman and celebrity interviews asking a lot of pop stars about cheese. In one Pulitzer worthy article I read all about the healthy teeth of Kylie and Jason. It left quite an impression. I made a solemn promise that like Kylie I would have such healthy teeth I would never need a filling. Cue a life long obsession with teeth brushing and a competitive streak that it appears is absent in all other walks of my life. I was doing pretty well with my pledge until my wisdom teeth. Three of the pesky blighters needed to be pulled in my late teens and early twenties because there just wasn't room for them in my mouth and teeth growing in side ways is less than pleasant. But my top right one grew in straight and since there was room for it the dentist decided that he had tortured me enough, it could stay. What I had neglected to tell him was my new tooth was so far back that I either gagged when trying to brush it or rammed the toothbrush into the side of my mouth giving myself mouth ulcers. Unfortunately, my dastardly plan was foiled when, within a couple of years of it's appearance it was decaying and needed a filling. I was properly distraught, I had failed my 8 year old self. I got the filling and pretended that I didn't want to invent a time machine so that I could go back and never read the article and make a promise that was destined to be broken. So when last month at my check up the dentist said that there was more decay on the same already fillinged tooth and that they were going to need to redo it I was stoic, it still only counted as one failure right? It takes ages to get an appointment for my dentist so I had ages to sulk before I was due back. Sulk and plot. What is the point of getting fillings on a tooth that I can't keep clean? Surely it would be better off just being pulled? It's not like anyone will ever see the gap. If they are going to have to give me the horrific anaesthetic jags I'd rather it was for something that was going to be permanent. So I went yesterday and much to my dentists surprise and the dental nurses utter horror asked them to just pull the tooth. The dentist admitted that it made a fair bit of sense and was probably easier than a filling anyway. Needless to say that I didn't tell him all about Kylie and Jason interviews in Smash Hits, I wanted a tooth pulled not a stay in a psychiatric ward! So today I can proudly say that I have no fillings at all in any of my teeth. Or I could if my face, mouth and head didn't hurt so much that I just want to curl in my duvet nest forever.